Bengals stadium: Worst. Deal. Ever? 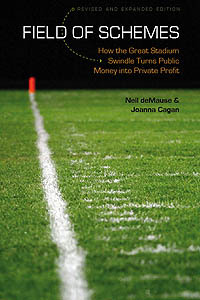 The initial $280 million price tag ultimately swelled to $350 million (if you believe the Bengals), or $454 million (according to the county), or $555 million (according to Harvard stadium expert Judith Grant Long, whose long-awaited book Full Count, I am assured, really is due out any month now). This last figure would set a record for public subsidies for an NFL stadium. As a result, the county has been facing steep debt payments: $34.6 million in 2010, equal to 16.4% of the county budget. As a result, the county has been slashing funding for things like schools, the sheriff’s department, and youth programs, and is now set to repeal the property tax reduction that was the carrot to get county residents to approve the Bengals stadium (and an accompanying Reds stadium) in the first place. Hamilton County hamstrung its own finances by agreeing to let the Bengals collect all parking revenues at the new stadium, while the public picked up all security costs. The team put pressure on the county by saying it would move to Baltimore without a sweetheart deal — but documents from the time indicate that Baltimore’s offer was capped at $200 million in public funds, and would not cover operating costs. The problem, it seems, is that unlike in other municipalities, Hamilton County footed the entire stadium bill itself — and counted on a 0.5% sales tax hike to make the bond payments. When sales tax revenues didn’t grow at the rate the county had hoped, it was left with a budget hole that’s grown progressively larger. “It’s the monster that ate the public sector,” says Mark Reed, Hamilton County’s juvenile court administrator. And finally, the punchline: Hamilton County commissioners are set to vote today on spending another $307,000 on the stadium, to upgrade its instant-replay system from analog to digital — stadium upgrades being the county’s responsibility as part of that lease that taxpayers arm-twisted the Bengals into accepting. Next step: holography! This entry was posted in Cincinnati Bengals, Cincinnati Reds by Neil deMause. Bookmark the permalink. This just makes me sad. You know what? We’re going to top this deal in Sacramento. And I don’t mean that in a good way. Just watch. We’ll agree to build an arena, and after we’ve already started construction, THEN we’ll negotiate a lease. Does the US court system generally look with kindness on action brought by people who were exploited by others based on nothing but their own stupidity? If so, does it do so even when those who are suing were warned in advance they were being stupid? Perhaps we’ve reached a new watershed in stadium subsidies. Perhaps the team has extracted so much ‘involuntary’ money from the citizens of Hamilton county that fans simply no longer have the cash to buy tickets/merch. Or maybe the Bengals are just so pathetic that fans would rather pay not to watch them than pay to watch. BTW, where are the elected officials that plumped for this scandalous deal now? And why aren’t they being investigated (‘directors’ insurance or no)? I highly doubt the Santa Clara council majority is paying any attention to this. They have absolutly no public doubts about the righteousness of what they’re doing. However, I’d be more impressed with their attitude if they were pledging their own personal assets against any project shortfalls (funny none have offered to do this). It’s amazing to read this story and an then disheartening to realize that the kind of thinking which created this problem is alive and well in Ramsey County, MN. Like the Hamilton County Commissioners, Ramsey county’s commissioners want to raise a sales tax .5% and give all profits to the Vikings (naming rights parking, etc). The Sacramento City Council has decided to merge their arena and transit proposals into a single project. Doesn’t it seem like it’s a little late in the process to make a change like this? I’m sure the idea is to capture state and federal transportation dollars to help pay for “a wall” or something, but I have to think this will delay the project. I just can’t see the Feds and the State deciding this by March 1. More coming out today from Think Big, I’m sure.